In 2019's winter season we'll get above normal temperatures. Our milder than normal forecast is due to the fact that the squirrels stopped eating at the cafe five weeks earlier compared to 2017. It'll be colder than last year! The squirrels have visited the cafe till 18th of Aug. 2017 which is a month longer compared to last year's sudden disappearance. Additional 4 weeks of food consumption is a first evidence of getting a colder winter this year. However, I'll have a look in the nut consumption data of 2016 and 2017 to find similarities or differences in the squirrel's behavior. A challenge in analyzing the nut data is that I can't differentiate individual squirrels. Therefore it is impossible to assign nut consumption to distinct squirrels. Neither do I have a clue if there has been any change in individual members of our squirrel group. There are some challenges left to improve data gathering for 2018. 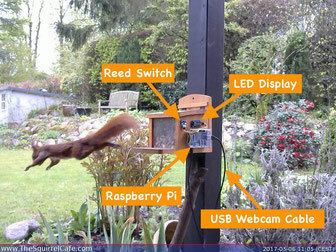 On June 12th TheSquirrelCafe got featured on the Hackster.io's Blog: "The IoT Squirrel Cafe Is Nuts! 🐿". Well, it blow me down! 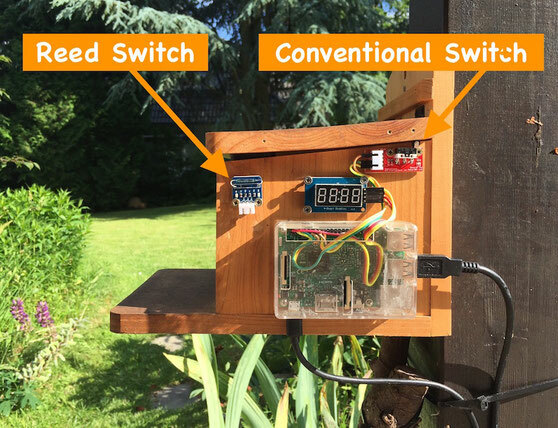 The first iteration of TheSquirrelCafe had a mercury switch attached to the lid to detect lid openings. To simplify the wiring the mercury switch had been replaced by a reed switch and a magnet attached inside the lid. I thought that this would be an easy and reliable solution to count how often the lid is opened, but this was wishful thinking. Unfortunately I've experienced that the reed switch sometimes sticks until tapped. Maybe the reed's contacts got magnetized? The Squirrel Cafe has undergone an extensive remodel. Our valued guests appreciated the remodel and are now more likely to spend time at the The Squirrels Cafe than before. The feeder has been replaced by a new one and sensor gadgetry has been updated as well. Instead of a mercury switch a reed switch is used to get rid of the lid's wiring. The blinking LED of the old Cafe had been upgraded to a 7-Segment LED display to be more informative. The display shows how often the lid had been opened by our guests. The original Raspberry Pi Cam has been replaced by a USB Logitech C270 webcam for simpler positioning and a crisper image. The homepage has been updated to reflect the changes. From now on the Twitter TL is showing the captured images instead of links only. The source code on GitHub has been updated as well.